The official beach towel of the subway-riding Coney sunbather. POP-UP ALERT: Today's the day: Brooklyn-based brand Marais USA's one-day pop-up sale in Greenpoint features select styles from their gorgeous gem-toned summery sandal selection. 55 Nassau Avenue at Guernsey, Greenpoint, Brooklyn; 12-9PM. 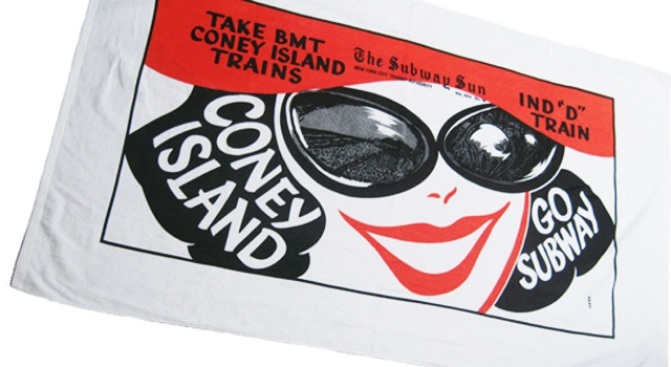 BEACH BAG: For the official kickoff of Coney Island's 86th season as New York City's shore-by-subway playground, pick up one of these delightfully retro 59 x 35-inch beach towels (featuring old ads for Coney) at the New York Transit Museum shop, in-store and online. REGARDING HENRI: So you know Henri Bendel is nixing its clothing departments, right? And it's shipping the crème of the merch to discount designer nook Gabay's Outlet in the East Village. Expect price tags up to 80% off on gen-u-wine haute goods from the likes of Choo and Chanel. This is major -- no dilly-dallying allowed. 225 First Avenue at 13th Street, (212) 254-3180.